Chile, officially the Republic of Chile (Spanish: República de Chile is a South American country occupying a long, narrow strip of land between the Andes mountains to the east and the Pacific Ocean to the west. It borders Peru to the north, Bolivia to the northeast, Argentina to the east, and the Drake Passage in the far south. Chilean territory includes the Pacific islands of Juan Fernández, Salas y Gómez, Desventuradas, and Easter Island in Oceania. Chile also claims about 1,250,000 square kilometers (480,000 sq mi) of Antarctica, although all claims are suspended under the Antarctic Treaty. A coastal country located in the southwest region of South America, Chile has an area of 756,950 square kilometers (292,258 square miles) and a total coastline of 6,435 kilometers (3,998 miles). 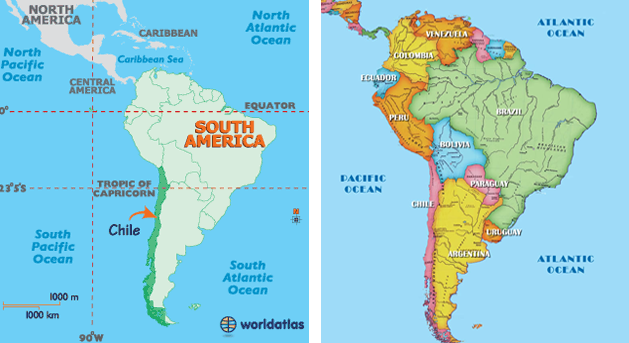 Chile shares its northern border with Peru and its eastern border with Bolivia and Argentina. Comparatively, the area occupied by Chile is nearly twice the size of California. Chile's capital city, Santiago, is located at the country's latitudinal mid-point. By bus, Santiago is approximately 1.5 hours inland from the Pacific Ocean and 1.5 hours west of the Andes Mountains foothills. From its northern border to its southernmost tip, Chile covers a diverse geographic array. In the north is the Atacama Desert, one of the driest places on earth, while the southern tip points towards the polar ice of Antarctica. The main attractions for tourists are places of natural beauty situated in the extreme zones of the country: San Pedro de Atacama, in the north, is very popular with foreign tourists who arrive to admire the Incaic architecture, the Altiplano lakes, and the Valley of the Moon . In Putre, also in the north, there is the Chungará Lake, as well as the Parinacota and the Pomerape volcanoes, with altitudes of 6,348 m and 6,282 m, respectively. Throughout the central Andes there are many ski resorts of international repute , including Portillo, Valle Nevado and Termas de Chillán. His Royal Highness, Honorary Consul of Republic of Chile in Qatar & Chairman of Chile Gulf Chamber of Commerce & Industry. He has extensive experience in assisting large multinationals enter new markets. Due to his extensive experiences and background he has been able to facilitate a unique & trusted platform for Multinational companies within these regions. His Royal Highness, President of Global Industrial Products (GIP) is a young & dynamic, Entrepreneur, Investor and Philanthropist. He was educated in Germany, UK and United States. 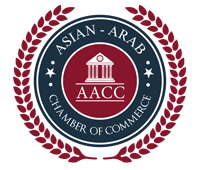 He is domiciled in Monaco and Qatar having his business operations in the GCC region. He founded Global Industrial Products in Chile and in Abu Dhabi, UAE. With a focus on Oil & Gas, Waste Water and Renewable Energy industries, GIP he has been successful in securing government projects within ADNOC, QP and respective subsidiaries. In addition to his business initiatives he has co-established The RACH Charitable Trust Foundation in the UK and USA to help people in need to help themselves. Due to his extensive experiences and background he has been able to facilitate a unique & trusted platform for Multinational companies such as PPG to conduct business’ within these regions. In consequence, through his international business relationships he acts as a liaison between the East and the West as well as North and South. In consequence, through his international business relationships he acts as a liaison between the East and the West as well as North and South. Through this network of contacts he can bring invaluable key insights on the market dynamics. He is the founder of Global Industrial Products in Chile and in Abu Dhabi, UAE with a focus on Oil & Gas, Waste Water and Renewable Energy industries. In addition to his business initiatives he has co-founded The RACH Charitable Trust Foundation in the UK and USA to help people in need to help themselves. He is an expert at lobbying at the highest levels and public relations. He has a world class team supporting him across all specialisms. © 2014 Honorary Consulate of the Republic of Chile, Doha - Qatar. All rights reserved.